Naked Society’s vision is to engage in projects and establish collaborations across areas that match our philosophy. This means, quite simply, that we include our heart and brain in all our work methods. The projects that Naked Society is involved in must therefore contain a certain degree of social aspect, and elements of considerable consideration for our environment. A project with support from the pool for “Grønne ildsjæle” by the Danish Ministry of the Environment, completed in 2013/2014. Donate it to Red Cross, hoping it will benefit some people. Both options are a way of closing your eyes, and hoping that something proper/responsible will be done with it, but we actually have no clue. Naked Society has attempted to develop a setup that creates a third solution for old clothes – so far for old jeans only. This solution is to donate it to us, through collections at schools and institutions. Hereafter, we transform the materials into new, exciting design products. For some products, we break down the material completely before we crochet it into different design and living products. For the products made of denim, we use recycled materials almost exclusively. In the future, we need to think more about the resources we have, and one of those is textiles. Today, a large part of our second-hand clothes is sent abroad, where it passes through several stages, before it is ultimately wasted at surplus stocks in Africa. If it is recycled, it is often for cloths or for isolation. At the same time, endless amounts of new textiles are produced every day around the world, all the while our raw materials are getting more costly. For this reason, solutions to reusing existing textile resources must be found – for new, exciting products that can make life a little more fun. Naked Society’s production of accessories such as bags, pillows, and puffs are examples of how to re-use used textiles in a design context. This is not necessarily the answer to all the world’s problems, but an example of how to create something beautiful and useful from something old and worn. In the spring of 2014, Naked Society experimented with an alternative collecting of clothes at schools and institutions. Here, we placed a stand that children and their parents could fill with old jeans. At the same time, we created a booklet with inspiration for schools that wished to work with recycling, re-use and textiles as a part of the teaching. Special Thanks to Trasborg Denmark and Several Schools in the Copenhagen Area, who made the fist collection possible, by donating jeans. Our experience is that both children and employees showed great interest in being a part of reusing different kinds of materials. It is typically during their school years that children learn what can be recycled and what needs to be thrown out, and Naked Society’s collection therefore fits perfectly because it opens your eyes to the fact that even things that may normally go in the trash can be given new life, if you think creatively. Together with the collection, we encourage schools to save ‘the top with pockets’ from the collected jeans, and leave the rest to us. This way, they are able to experiment with how to use the material in new contexts during their creative courses. Naked Society has received the privilege of being chosen to participate in Danish Craft Collection no. 18. Danish Craft Collection is an annual collection of the best in Danish crafts and design, which is shown every year at the Parisian lifestyle fair, Maison et Objet. As a part of the Danish Craft Collection, Naked Society’s Recycled Denim Collection is shown in a curated exhibition together with other Danish design products on a centrally placed booth at the fair. At the same time, they are also shown on danishcraft.com for the following year. The goal is to promote Danish design worldwide, and Naked Society is proud to be selected for this with our different design that tells a story of re-use, Scandinavian design, and new standards for recycled materials. Naked Society has a social and environmental strategy with focus on producers that are exposed, and who may therefore obtain better living conditions and reduced marginalization due to their professional work, both economically and socially. The Green Enthusiasts’ project, ”Old Jeans, New Life’,” involves a crafting project in Denmark as a production place, where over fifty ethnic minority women are assigned. 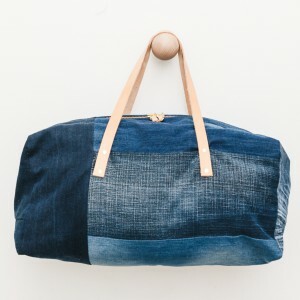 The production of recycled denim products in Tanzania is carried out in collaboration with NGO’s, fairtrade producers, and small business owners. An example of one of our partners is the NGO that educates HIV-positive women in sewing, all the while providing a safe environment and medicine. Another partner is a fairtrade textile producer that works with exposed groups in Tanzania. All the women and groups are limited with regard to technical and physical capabilities, but through the cooperation they are challenged creatively, also in their craft.